This recipe comes from my Cooking Moroccan recipe book. Chermoula is both a marinade and a sauce and can be found in the cuisines of the North African countries of Algeria, Libya, Morocco and Tunisia. Use it when making fish, seafood, grilled meat, slow cooked lamb and vegetables. 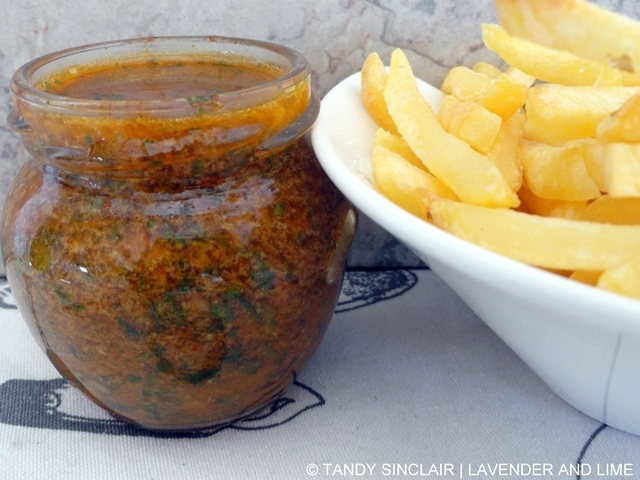 Like most Morrocan condiments, chermoula uses preserved lemons. I think it would taste just as good using my preserved limes. Each region has its own unique take on this sauce. Do you know how long preserved lemons keep? I want to make some, but am afraid of making too much and having in spoil. (My pear and almond bit is posted).